After yesterday’s high drama, where seven runners suffered serious injuries from goring, the seventh running of the bulls of the Sanfermin fiestas, with bulls from the Antonio Bañuelos bull-ranch in Castile, was clean and exciting. There were only four injuries and none of these from the horns of the bull. The tensest moment occurred at the end of the Telefónica stretch when a brown-colored bull slipped up and took several seconds to get to its feet on the right side of the fencing. However, it soon continued its route into the ring. The run only took 2 min. 40 sec. in all. The pack raced out of the pens in Santo Domingo at a fast pace and in a compact group. The bulls were turning their heads from side to side but did not make any charges and they maintained this noble feature over the whole course which helped to put yesterday’s agonizing moments behind us. The bulls stayed in a compact group until the end of the City Hall stretch. At the beginning of Mercaderes street a couple of bulls slipped and fell and the pack began to break up. A runner also slipped up here and was trampled on by most of the passing animals. Lots of runners were slipping and tripping up due to the fast pace of the pack at all stretches of the course. The three leading bulls with trailing bell-oxen chased past the Mercaderes corner without slipping or crashing into the fencing. Some meters behind came a fourth bull followed closely behind by the two bulls which had slipped up and they remained in this order until the entrance to the bull ring. 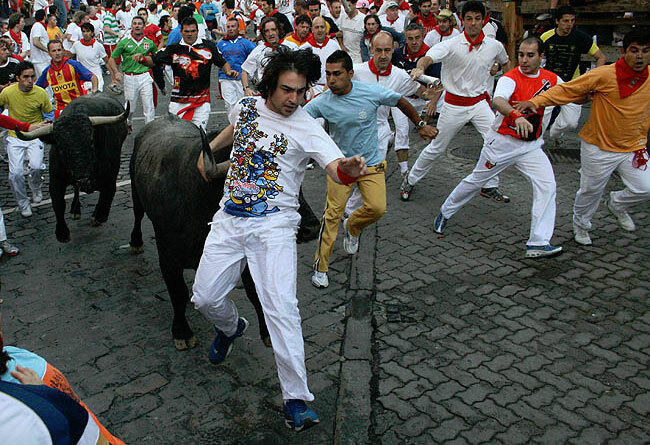 This distance between the bulls along the length of Estafeta Street allowed for some fine running as the runners found space close in front of the horns to show their daring. The bulls continued at a very fast pace and there was a dangerous moment when one of the leading bulls – the brown-colored one – slipped up and remained several seconds on the ground, unable to lift itself to its feet. The fourth bull coming behind was on the point of crashing and slipping against the fallen animal and indeed, some runners coming behind tripped and fell over the animal. Luckily, the bull made no attempt to toss its head at the runners. It continued to try to get to its feet without success. The final two bulls coming up behind passed out the brown bull and continued ahead. At this point the bull finally got to its feet and charged ahead at a quick pace. The bulls entered the bull ring separately but, as usual, the “dobladores” with their capes were very fast and efficient in leading the bulls to the pens; first two black bulls entered, and another one close behind them. Then the two bulls than had been taking up the rear for most of the course were lead in, and finally, the brown-colored bull which had managed to attract most of the attention during today’s largely incident-free running of the bulls.